1. Complete and total abuse of established canon events, facts, and/or characters in the shiny fandom you hold dear to your heart. 2. Huge, epic surreal type fantasies that are essentially unbelievable EVEN in a science fiction arena — because THAT is what entertains me. 3. I sometimes use betas (and they are awesome for working on my behalf in their spare time) but I don’t have a professional editor for the material on this site and I’m sure as hell not going to pay one to edit fan fiction. That being said– you will find grammar problems and typos. Nothing is perfect–least of all me. I can be a very bitchy girl so abuse me, preach at me, or lecture me at your own risk! I’m not saying I’ll curse you to sleep for a thousand years by making you prick your finger or anything (blinks innocently). This is so very, very you. This has had me giggling in the library. It’s such a good job I’m sat right at the back in the corner. Thanks for all the joy you bring Keira. 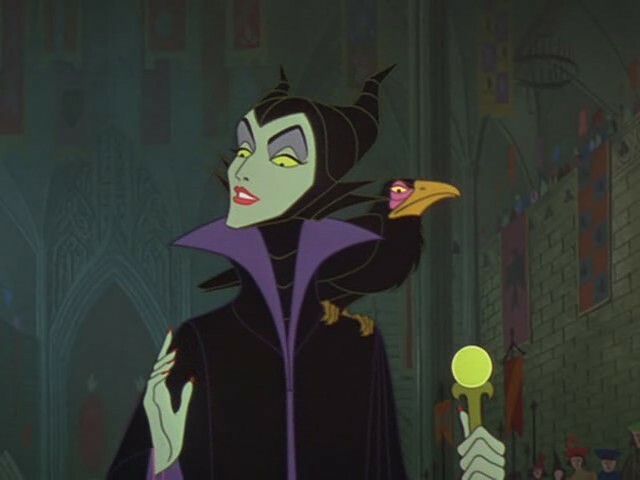 Maleficent has always been my favorite Disney character, much more so than the ‘good guys’. She was so very confident in her opinion, so uncaring of what the others thought. In other words, she’s you! …do you like any anime? ….I’m writing a crossover fic between the harry potter universe and the naruto universe, would you like to read it? I’m kinda stuck and none of my friends are reading anything…. I can’t tell if it’s worth trying to continue…. I get a few reviews but the truly aweful fics get those too….if you have any interest please let me know and I’ll send you a link. p.s. still obsessing over all your work, especially ties that bind. Actually, I know absolutely nothing about anime. My husband loves it and owns a bunch of DVDs and despite my efforts to “hang out with him” when we were dating anime has never held my interest. Which is good because I’ve heard some stuff about those fandoms that would make me run screaming in the other direction. LOVE the bio!!! He he, you gave me a giggle. I love your work and have to say you’re a gal after my own heart! Well done on expertly writing the beautifully entertaining fics that we love. Hey Keira, have you ever considered doing something with Glee (if you watch it) or the movie Labyrinth (if you have not seen this movie I will be horrified and demand you go watch it)? If you don’t think you ever will, can you cast David Bowie as a character for one of your series at one point? To be honest, your what might have been verse has became so much more deer to me than canon, every time I watch an episode i’m wondering why John and Rodney are not making out and tell they love each other in their messed up snarky way I came to adore so much. Get well soon and keep doing the job the canon writers never dared to put on paper. Hello, I have recently gotten into the Star Trek Fandom and I just finished reading all the stories you have posted for the Tangled Destinies Series and fell completely in love with the series. I look forward to your other 3 stories! It’s a refreshing new twist and I love the chemistry between all the characters specially between Amanda and Sarek since in the movie you didn’t get to see it so thorughly. I hope you write more stories about Kirk and Spock! I know that you guard your privacy zealously, for which all of your sane fans are grateful, but I was wondering if you might be willing to post your home state. With all the various weather issues in the southern States of late I’m sure I’m not the only rabid fan getting worried for your safety when listening to the news. Would be reassuring if we only worried specifically about one state. Thanks for all the awesomeness! Gotta say I found you today, at probably one of my lowest points in writing fandom since I started oh maybe 7-8 years ago. And the best thing I could have done was to stumble onto your site, and more importantly you opinions. Reminded me why I got into this in the first place, to have fun for me and no one else. You are preaching to the Choir talking about entitlement. I co-write with a person who has become a great friend, however she is schizophric, we work so well together it doesn’t bother me. But there have been times when she had to be hospitalized and we couldn’t get together. The outcry and demand for “more-more-more” drove me crazy. The last time it happened we decided not to post anything until the story was complete. This last story took us almost a year to get written, but hey we sure had fun writing it. At any rate, I’m sure you aren’t interested in my tale of woe, not even sure why I told you except to say your radio blog and personality really made my day. And as far as I am concerned it’s your story and everyone can gnash their teeth in silence, as they wait for more chapters at yours or my convenience. My only opinion of you and your work? Keep on keeping on your ideas make my day and give support to my own thoughts and feelings.